This information is for anyone who has been given a diagnosis of personality disorder and for their family and friends. It's not easy to pin down exactly what we mean by the word ‘personality’. It seems obvious, but it can be hard to put into words. This can be because the words we use to describe people tend to have wide meanings – and these meanings often overlap. These words can also cover more than one kind of experience. For example, ‘shyness’ describes the feeling of awkwardness with other people, but also how we behave by being rather quiet in company. It is also difficult because the way we behave - and appear to other people - can be very different in different situations. You can know a person well at work, but find that they behave quite differently in their private life. By our late teens, or early 20s, most of us have developed our own personality. We have our own ways of thinking, feeling and behaving. These stay pretty much the same for the rest of our life. Usually, our personality allows us to get on reasonably well with other people. For some of us, this doesn't happen. For whatever reason, parts of your personality can develop in ways that make it difficult for you to live with yourself and/or with other people. You don't seem to be able to learn from the things that happen to you. You find that you can't change the bits of your personality (traits) that cause the problems. These traits, although they are part of who you are, just go on making life difficult for you - and often for other people as well. There have been difficulties in clearly defining personality disorders. Previous research studies have suggested that up to 1 in 5 people might have a personality disorder. However, a larger and more rigorous UK study in 2006 suggested that, at any given time, about 1 in 20 people will have a personality disorder. People with a diagnosis of personality disorder have not, in the past, had enough help from mental health services. These services have been more focused on mental illnesses like schizophrenia, bipolar disorder and depression. There have been arguments about whether mental health services can offer anything useful to people with personality disorders. Recent research makes it clear that mental health services can, and should help people with personality disorders. Do personality disorders change over time? It can, however, sometimes work in the opposite direction. For example, schizotypal personality disorder can develop into the mental illness schizophrenia. There are different ways to describe mental disorders, and to put them into categories. The first step is to see if there are patterns, or collections of personality traits that are shared by a number of people. Once these patterns have been identified, we can start to find effective ways of helping. As you read through the descriptions of each type, you may well recognise some aspects of your own personality. This doesn't necessarily mean that you have a personality disorder. Some of these characteristics may even be helpful in some areas of your life. If you do have a personality disorder, some of these traits will be spoiling your life - and often the lives of those around you. The symptoms and difficulties may not fit exactly into any one of these categories. You may see aspects of yourself in more than one category. Professionals, too, may find it hard to give you a single diagnosis. This is not unusual. It is pretty hard to describe any personality clearly, and so it can be difficult to make a clear diagnosis of personality disorder. It may be more helpful to think of these diagnoses, not as clear categories, but as exaggerations of normal, overlapping personality types. The answer is not clear, but it seems that like other mental disorders, upbringing, brain problems and genes can play a part. Some people with antisocial personality disorder have very slight differences in the structure of their brains, and in the way some chemicals work in their brains. However, there is no brain scan or blood test that can diagnose a personality disorder. What treatments are available for personality disorder? Treatment for people with personality disorders can be psychological (talking therapies) and/or physical (medication). A number of psychotherapies seem to work well, particularly for cluster B personality disorders ('Dramatic, Emotional and Erratic'). They all have a clear structure and idea of how they work which must be explained to the patient. Mentalisation Based Therapy (MBT) - combines group and individual therapy. It aims to help you better understand yourself and others by being more aware of what’s going on in your own head and in the minds of others. It is helpful in borderline personality disorder. Dialectical Behaviour Therapy (DBT) – this uses a combination of cognitive and behavioural therapies, with some techniques from Zen Buddhism. It involves individual therapy and group therapy, and is helpful in borderline personality disorder. Cognitive Behavioural Therapy (CBT) - a way to change unhelpful patterns of thinking. Schema Focused Therapy - a cognitive therapy that explores and changes collections of deep unhelpful beliefs. Again, it seems to be effective in borderline personality disorder. Transference Focused Therapy - a structured treatment in which the therapist explores and changes unconscious processes. It seems to be effective in borderline personality disorder. Dynamic Psychotherapy - looks at how past experiences affect present behaviour. It is similar to Transference Focused Therapy, but less structured. Cognitive Analytical Therapy - a way to recognise and change unhelpful patterns in relationships and behaviour. Treatment in a therapeutic community – this is a place where people with long-standing emotional problems can go to (or sometimes stay) for several weeks or months. Most of the work is done in groups. People learn from getting on – or not getting on - with other people in the treatment group. It differs from 'real life' in that any disagreements or upsets happen in a safe place. People in treatment often have a lot of say over how the community runs. In the UK, it is more common now for this intensive treatment to be offered as a day programme, 5 days a week. People with personality disorders are more likely to have another mental health difficulties, like depression and anxiety. Medication is often prescribed to people with personality disorders to treat these difficulties, for which it can be very effective. There has not been much research into whether medication can help with the symptoms of personality disorder themselves. Prescribing medication for this purpose is not advised by the National Institute for Care and Health Excellence (NICE - the leading medical guidance-producing organisation) and medication cannot 'cure' a personality disorder. However, many psychiatrists do prescribe medications to try to reduce individual symptoms. Can reduce the suspiciousness of the three cluster A personality disorders (paranoid, schizoid and schizotypal). Can help with borderline personality disorder if people feel paranoid, or are hearing noises or voices. Can help with the mood and emotional difficulties that people with cluster B personality disorders (antisocial or dissocial, borderline or emotionally unstable, histrionic, and narcissistic) have. Some of the selective serotonin reuptake inhibitor antidepressants (SSRIs) can help people to be less impulsive and aggressive in borderline and antisocial personality disorders. Can reduce anxiety in cluster C personality disorders (obsessive-compulsive, avoidant and dependent). Can help with unstable mood and impulsivity that people with borderline personality disorder may experience. The short-term use of sedative medication as part of a larger care plan can be useful during a crisis. Many people with personality disorder can lead full lives with support. This can be emotional - somebody to talk to - or practical - help with sorting bills out or arranging things. The support can be given by friends and families, self-help groups and networks, as well as your GP or mental health team. You might need such support occasionally, when things get particularly difficult, or you may need it regularly. If you have a personality disorder, you may not need treatment at all - but you might find medication or talking treatments helpful, and sometimes both. Admission to hospital usually happens only as a last resort (e.g. when a person with borderline personality disorder is harming themselves badly) and for a short time. A lot of help that was once only offered on hospital wards is now available in day centres and clinics. People with a personality disorder, just like anyone who has mental health difficulties, can be stigmatised because of their diagnosis. They can attract fear, anger and disapproval rather than compassion, support and understanding. This is both unfair and unhelpful. Personality disorder is a real problem that demands real help. We can all help by being friendly, supportive and understanding, rather than being judgemental. Try to unwind when stressed - have a hot bath or go for a walk. You may find yoga, massage or aromatherapy useful. Make sure you get a good night’s sleep - but don’t get too upset if you can’t sleep. Look after your physical health and what you eat. You'll feel better on a balanced diet, with lots of fruit and vegetables. If things get really tough, try phoning the Samaritans (see further information). You may worry about the effects the personality disorder is having on them, and perhaps on your life too. How would they react if you talked to them about it? Day-to-day living with someone who has a personality disorder can be difficult - but it isn’t always difficult. Giving people their own space, listening to and acknowledging their concerns, and involving others (friends, relatives and, at times, mental health professionals – nurses, therapists or doctors) can all be useful. It is also important to look after your own physical and mental health. 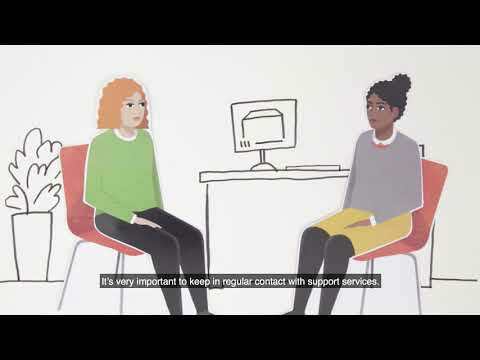 Emergence is a service user-led organisation supporting all people affected by a diagnosis of personality disorder, whether you are a service user, carer (which is a family member or friend of a service user) or a professional in the field. Mind is a leading mental health charity in England and Wales and has extensive information on personality and personality disorder. This provides information, resources and learning opportunities for those with a personality disorder and their carers. Contains information about the network set up by the Mental Health division, and provides information about the services available for those with personality disorders in Scotland. Samaritans is available 24 hours a day to provide confidential emotional support for people who are experiencing feelings of distress or despair, including those which may lead to suicide. The website has helpful information about stress and self-harm. Rethink is a leading national mental health membership charity and works to help everyone affected by severe mental illness recover a better quality of life. Has information on personality and personality disorder. Assists and supports those suffering from depression (which can occur in those diagnosed with a personality disorder) and their families in Ireland. A helpline is available as well as support groups, lectures, and current research on depression. This information was produced by the Royal College of Psychiatrists’ Public Education Editorial Board. This information reflects the best available evidence available at the time of writing.